The Cassini Science Symposium has been cancelled. Acting Planetary Science Division Director Lori Glaze recently informed the Cassini project that additional funding anticipated in FY19 will be limited to a small transition amount. So, the Cassini Science Symposium, to be held May 20th – 24th at APL, has been cancelled to minimize travel and meeting expenses. Remaining Cassini funds will be used to help support, to the extent possible, the highest priority human resources, including students, postdocs, early career scientists and other investigators who are disproportionately impacted. Thank you for your tremendous contributions to date. APL will host a five-day meeting to review the latest findings on the Saturn and Jupiter systems, including the interpretation and synthesis of results. Sessions will include invited and contributed interdisciplinary talks covering the following broad disciplines: Planets, Magnetospheres, Rings, Titan, and Icy Satellites. Presentations emphasizing Saturn-Jupiter synergies are encouraged. The Symposium will serve as a springboard for future studies and space missions and future mission posters are welcome. Join the Cassini Science Symposium eNews list to receive updates about the event. If you no longer wish to receive Cassini Science Symposium E-News, please click here to be taken to the unsubscribe page. 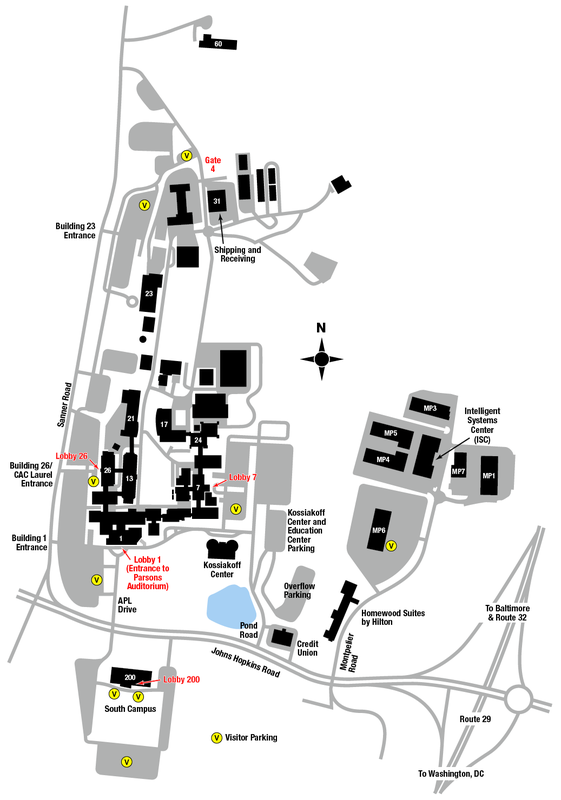 The Johns Hopkins University Applied Physics Laboratory in Laurel, Maryland is a University Affiliated Research Center (UARC) that develops solutions to critical national challenges through the innovative application of science and technology. Please contact APL via e-mail at SES-2019-Cassini-Symposium@jhuapl.edu. APL is located on Johns Hopkins Road in Laurel Maryland, approximately 1/2 mile west of U.S. Route 29. * There is ample parking at building 200. A limited block of rooms has been reserved at the hotels below. Book your room using the link and information below. Ordered from closest to furthest from APL. Take exit 38 (Maryland Route 32-sign will read "Toward Columbia") west to US 29 south. (Exit 38 is approximately 10 miles from the Baltimore Beltway, I-695.) Proceed about 1.5 miles on US 29 to Johns Hopkins Road. Turn right. APL is a quarter mile west. Turn left off of Johns Hopkins Road (immediately after Pond Road on the right). Take exit 38 (Maryland Route 32-sign will read "Toward Columbia") west to US 29 south. (Exit 38 is approximately 10 miles from the Washington Beltway, I-495.) Proceed about 1.5 miles on US 29 to Johns Hopkins Road. Turn right. APL is a quarter mile west. Turn left off of Johns Hopkins Road (immediately after Pond Road on the right). Proceed on US 29 to and exit onto Johns Hopkins Road. APL is a quarter mile west. Turn left off of Johns Hopkins Road (immediately after Pond Road on the right).